Bill Evans — Another Time: The Hilversum Concert, a spectacular never-before-heard live recording by the Bill Evans Trio featuring bassist Eddie Gomez and drummer Jack DeJohnette recorded in Hilversum, Holland, in the summer of 1968. Another Time is 2xHD’s first follow-up release to the widely celebrated Bill Evans Trio album, Some Other Time: The Lost Session from the Black Forest. 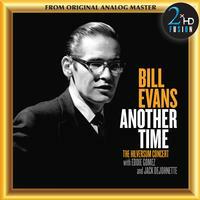 2xHD is pleased once again to release this entirely new Bill Evans discovery in full cooperation with the Bill Evans Estate and Eddie Gomez and Jack DeJohnette and Universal Music Group, the parent company of Verve Records, the label Evans was signed to in 1968.